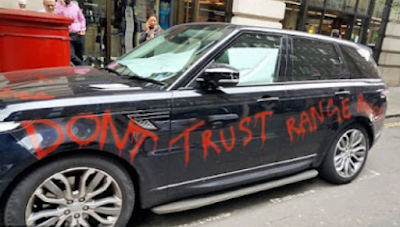 An aggrieved Range Rover customer who dumped his car in a Mayfair street covered in graffiti has threatened to burn it live on camera if the company fails to sort out its glitches. Dev Bath’s black Range Rover Sport, which cost him more than £70,000, has been turning heads since he ditched it in one of London’s most affluent districts on Tuesday. Another sign states: ‘Car not fit for purpose. Range Rover don’t care’. Mr Bath says that a glitch has resulted in repeated warning lights telling him not to drive the car but claims to have ended up in a stand-off with the dealership over the repairs. The business director claims that Range Rover have repeatedly contacted him demanding he move the vehicle as it is ‘damaging its brand’ – however he has refused to and vowed to set fire to the car live on camera unless the company fix it.